Connect a switch to your LEDs or other projects for easy on-off operation. You don't need to keep unsnapping the battery snap or unplugging from the wall. With this compact wired 1 Amp push-on push-off locking switch inline you can enjoy the convenience of simply pushing a button! Our switch comes pre-wired with 8 inch leads. 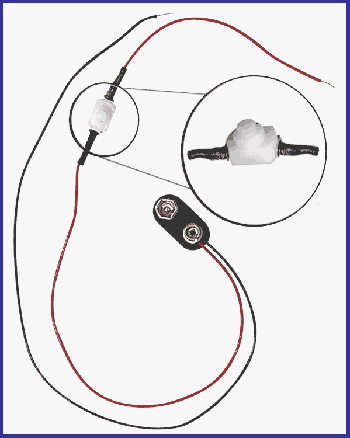 You will add the switch wire inline with ONE lead on your battery strap or other power supply. The other wire from the switch will go to the LEDs as normal. Have a look at this picture for help, to see how we add a switch to our battery strap. OR just get the switch pre-connected to a battery strap. We now have our popular switch in black too!